Babouche are handmade Maroccan genuine leather shoes, that we recommend to you as slippers for the house. 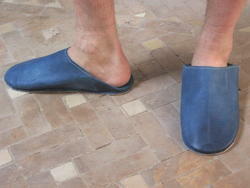 The soft sheep leather of these Moroccan slippers (Babouche) adapt to the shape of your foot in a very comfortable way. Gundara imports the Babouche directly from the producer (Mr. Saidi) in Marrakech. The nice thing about purchasing Babouche through Gundara is that through this direct way of production as much money as possible stays with the local artisans themselves and it is not lost through numerous middlemen. The entire value chain takes place in Morocco. The leather is tanned there, dyed, if needed, and then the shoemaker makes these nice oriental genuine leather slippers out of the soft sheep leather. Babouche are a nice present for good friends, so that they keep warm feet at home! Real leather babouches from Marrakech, Morocco. Check out our variety of colours. 100% sheep leather. Sole from camel leather. Ahmed is a Berber from the mountains around Marakech. He was born in 1960 and makes babouche -leather slippers- since he was little. He learnt this craft from his brother. The sheep leather he uses to makes his fine leather slippers he directly buys from tanneries in Marakech. His family (his wife, two sons and one daughter) live in the mountains and whenever he can, he packs his things and visits them up there in the fresh mountain air.